DeLong Gum produced a single run of 24 cards in 1933, the same year Goudey debuted with their comparatively large (and classic) 240-card set. Bright colors, thick stock, and professionally written text help both sets stand out from a mishmash of drab 1920s candy issues. 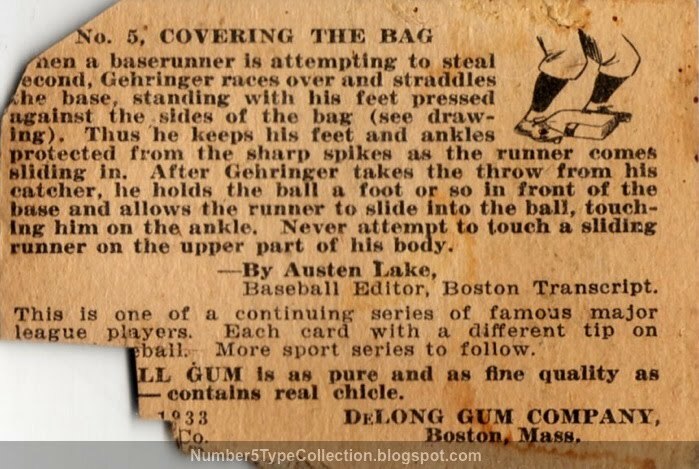 Company founder Harold C. DeLong worked for Goudey until 1932 and likely left to start a competing gum business. He almost certainly helped Goudey develop their baseball promos, so it's natural his next company would also feature cards. 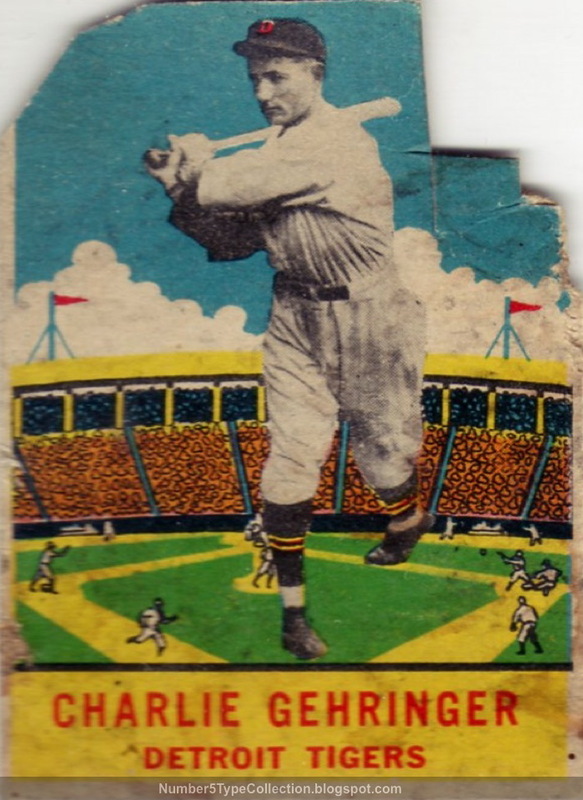 Its use of black-and-white photos over a painted ballpark compares favorably with Goudey's own design, but DeLong apparently couldn't afford to print many cards and failed to draw wide interest from collectors. Gehringer's one of baseball's best second basemen ever, both with the stick and the glove. In 19 seasons, he only played 15 games at any other position, a handful each at first and third. Mazeroski was probably a better fielder, but nowhere near Charlie's .320 career average and 8 top-10 MVP voting finishes (and one award in 1937). This hacked-up card's definitely in the spirit of my current poll about evils youngsters visit upon their possessions. I don't remember going all "crazy with scissors" like this card's owner, but might've just blocked it out. At least they left most of the back text intact, giving us insight into the hazards of base-running in Charlie's era. "When a baserunner is attempting to steal second, Gehringer races over and straddles the base, standing with his feet pressed against the sides of the bag (see drawing). Thus he keeps his feet and ankles protected from the sharp spikes as the runner comes sliding in. After Gehringer takes the throw from his catcher, he holds the ball a foot or so in front of the base and allows the runner to slide into the ball, touching him on the ankle. Never attempt to touch a sliding runner on the upper part of his body." You might never own a DeLong, but the full set's part of the Virtual Card Collection! Fakes / reprints: Several companies reprinted DeLongs over the years and I'm sure fakes also exist. Watch out for typical warning signs like too-bright paper, laser-cut edges, and dot printing. My best advice starts and ends with "buy from a reputable dealer who knows vintage inside-and-out." You could claim the card was die-cut! Now who will offer me $1000 for this unique, die-cut Gehringer...?